Duval Fence Company provides only the highest quality commercial security enclosures to the Jacksonville and surronding Duval County area including Orange Park, Mandarin, Arlington, Jacksonville Beaches, Ponte Vedra, St. Augustine, Duval County, Clay County and St. Johns County. Why whould you want to have a commercial security gate installed on your commercial property? Chain link fences are widel used and are typically the most popular choice for security measures. Not only does the high profile and just the presence of a steel fence deter most unwanted tresspassers but chain link fences are tough and durable. Chain link fences can have barbed wire or razor wire added as an additional protective feature which is sure to keep your property protected. Why should I use secure entry with a commercial security gate? A secure entry gate, when coupled with a chain link security fence can allow you to know who is entering and leaving your property and when they enter and leave. You can have Duval Fence install a secure key pad, making everyone who enters have a PIN number or you can set up a call box and manually let customers or suppliers in the gate. 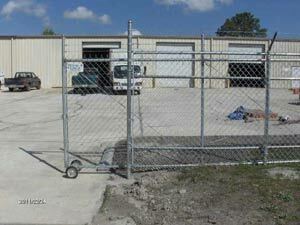 Contact Duval Fence today (904) 260-4747 or by email to get a free estimate on a new commercial security gate!